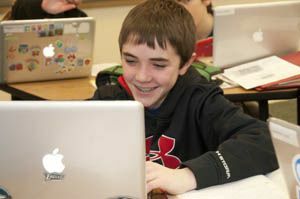 The "one-to-one" student laptop program at Wilmington Friends School has been named an "Apple Distinguished Program." The designation, which applies for two years 2013-2015, recognizes the learning environment at Friends "for innovation, leadership, and educational excellence." The recognition is based on demonstrating five "best practices" of an Apple Distinguished Program: visionary leadership, innovative learning and teaching, ongoing professional learning, compelling evidence of success, and a flexible learning environment.